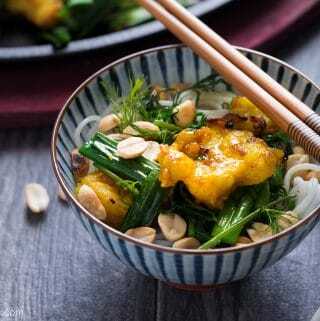 Vietnamese turmeric fish with noodles (Cha Ca La Vong) is a delicious and iconic dish of Hanoi. 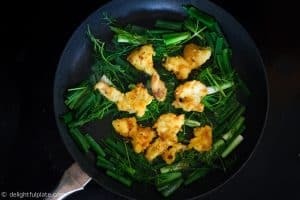 Chunks of flavorful fish are plated on a bed of aromatic green scallions and dill, boasting a unique dining experience. 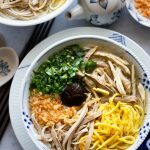 Besides pho noodle soup, Cha Ca La Vong and Bun Thang are two other iconic dishes that represent the elegance and complexity of Hanoi cuisine. The official names of this dish are Cha Ca or Cha Ca Hanoi. 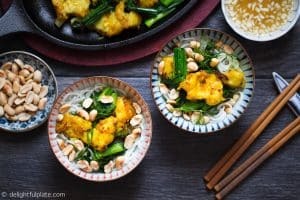 It features grilled fish that has been marinated with turmeric, tossed with sautéed scallions and dills, and served with vermicelli noodles, roasted peanuts and dipping sauce. Visually, the dish looks stunning with beautiful golden fish and green herbs. In terms of taste, it has a perfect combination of sweet, savory, sour and umami. Turmeric gives the fish not only a bright yellow color but also a mild earthy flavor. A variety of textures from the ingredients also makes eating Cha Ca fun and exciting. If you visit Hanoi, there is no doubt that Cha Ca La Vong is a must-not-miss dish. There are a number of restaurants specialized in serving this dish. The most famous one also has the name of Cha Ca La Vong, and some other popular ones are Cha Ca Thang Long and Cha Ca Anh Vu. 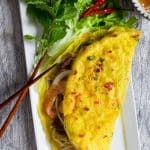 Since it’s a Northern Vietnamese dish, it’s not easy to find a restaurant serving this dish in the U.S. I remember that several Vietnamese restaurants in London have Cha Ca on their menu. Anyway, don’t worry because you can make it in your kitchen. We’ll get to how to cook it soon :). Traditionally, Cha Ca is finished at the dining table. The restaurants would bring out grilled fish, fresh scallions, dills, noodles, peanuts and dipping sauce. Diners would be provided a portable gas stove and a skillet in which they would fry/sauté scallions and dills and then add grilled fish, mix and finish cooking. After that, each person would put some vermicelli noodles in their bowl and top with cooked scallions, dills and fish which are still hot right off the skillet. The main ingredients for this dish are fish, scallions, dills, turmeric marinade, vermicelli noodles, roasted peanuts and dipping sauce. 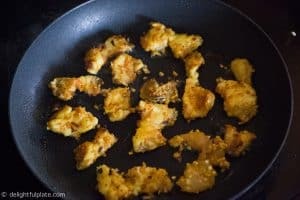 To make Vietnamese turmeric fish, you should use fillets of fairly firm white fish. Over the years, we have tried making it with cod, halibut, catfish, grouper, and monkfish. 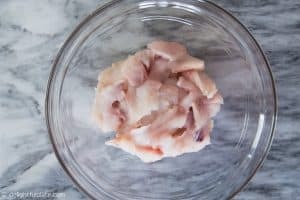 They are all great choices, but the best one is monkfish thanks to its texture. The texture is somewhat like lobster with the right amount of softness. The one I like the least is cod because it’s a bit too delicate when fully cooked. Honestly, I think it’s okay to omit this ingredient because the dipping sauce will provide the sourness to the dish. If you want, you can add 1-2 tablespoons of sour cream or yogurt to the marinade for an even more authentic taste :). 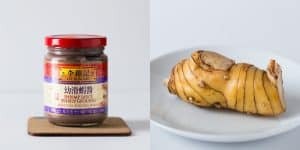 You can find galangal and shrimp paste at Asian grocery stores. When shopping for shrimp paste, you should look for the one with the Vietnamese translation as “mam tom“. It can also be labeled as shrimp sauce. Shrimp paste has a strong pungent smell, so if you have never used it before, hold your breath before opening the jar. It adds a lot of umami to the dish though, so don’t be afraid to give it a try. If you decide shrimp paste is not for you, just substitute with fish sauce. If you are unable to find galangal, increase the amount of shallot and add a small amount of ginger. 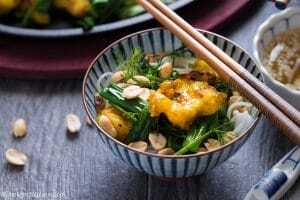 It’s easy to cook Vietnamese turmeric fish at home. You just need to marinate the fish and then pan-sear or broil it in the oven. After that, cook the herbs and throw in the fish, mix and all done. Restaurants usually use a lot of oil in this dish, but I cut it down to make it healthier. , I just heat the plate and transfer the cooked fish and herbs there and serve. 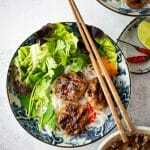 Another vermicelli noodle recipes that are served with no broth like this one are this Vietnamese Beef Noodle Salad (Bun Bo Xao) and Vietnamese Grilled Pork Meatballs with Noodles (Bun Cha). All three noodle dishes are very popular in Hanoi. 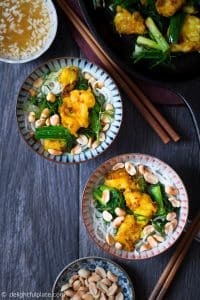 Vietnamese turmeric fish with noodles (Cha Ca La Vong) is a delicious and iconic dish of Hanoi. Chunks of flavorful fish are plated on a bed of aromatic green scallions and dill, boasting unique dining experience. Slice fish into 1/2 – 3/4-inch thick pieces. You may need to slice on an angle to have wide pieces. Peel galangal, slice and finely chop. If possible, use a pestle and mortal to crush into finer pieces (about 3 tablespoons). In a mixing bowl, add fish and all ingredients in the first group and mix well. Refrigerate and marinate for at least 30 minutes or more for a tastier result. Cut scallions into 2-inch long pieces, keep the white and green parts separated. Also cut dills into 2-inch long pieces. Whisk together all ingredients for the dipping sauce, taste and adjust to your liking. After fish has been marinated, remove from the refrigerator. Place a pan over medium high heat, add cooking oil, put fish in a single layer and sear and both sides to cook. You may need to sear in several batches. Another option is to broil fish on high for 8-10 minutes. Transfer to a clean plate. Wipe the pan clean, place over medium – medium high heat. Add oil and then add the white part of scallions. Sauté for about a minute until color starts to develop, then add the green part. Sauté for 20-30 seconds and then add dill. Give everything a quick mix to combine and wilt the dill. Add fish slices to the pan, stir to mix with scallions and dills. Be careful to not break the fish slices. Transfer everything to a preheated cast iron fajita plate or a regular plate and serve immediately with noodles, roasted peanuts and dipping sauce. You should use fillets of fairly firm white fish. Over the years, we have tried making it with cod, halibut, catfish, grouper, and monkfish. They are all great choices, but the best one is monkfish. Cod can be delicate when cooked. If you have a portable burner, you can try serving it at the table in the same way as at Vietnamese restaurants. After step 7, at your dining table, turn on the portable burner, place a skillet over it. When the skillet is hot, continue with step 8 and 9. If you don’t like shrimp paste, just substitute with fish sauce. 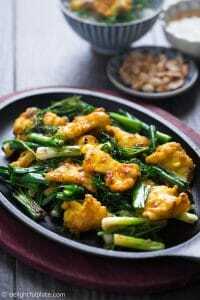 If you are unable to find galangal, increase the amount of shallot and add a small amount of ginger. This looks fantastic! Though I‘ve never been to Vietnam, I love the earthiness of turmeric and the brightness of the veggies. Can‘t wait to try. Thank you for your comment! 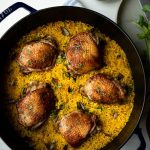 If you love turmeric, I think you will like this dish. Please feel free to let me know what you think if you try it :).